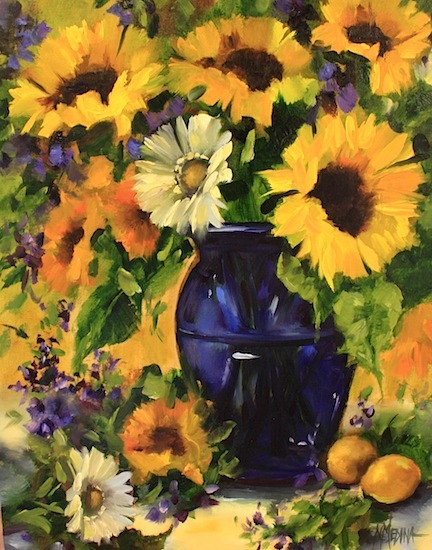 Joy Sunflowers and Lemons was a demo painting completed during my workshop last weekend in the Texas Hill Country. I had a wonderful, talented class of exactly one dozen ladies who joined me at the Baron Creekside Resort school. Our classroom had big windows on both sides and high ceilings. In the mornings we kept the doors open to let the cool breezes in while we had our donuts and got our paints prepared. I was really lucky that to have this beautiful blue vase and a great selection of flowers from the HEB grocery store in town *sound of harps*, Carlos' absolute favorite place to shop. At the end of class this painting went home with my student and painty pal J'Lynn from North Texas. Here's Miss J'Lynn posing pretty with her blossoms. J'Lynn looks innocent doesn't she, but you should know that she is pretty darn good at hiding her chocolate chip cookies from interlopers... although I did get one when she weakened her resolve a bit on day 3! 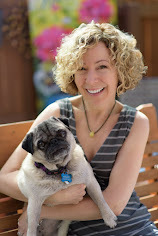 I've been busy setting up workshops for 2012 and 2013 and would love to come teach in your neck of the woods. 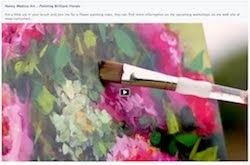 Contact me if you have a local painting club or facility and you find you are in dire need to someone to demo bright flowers. 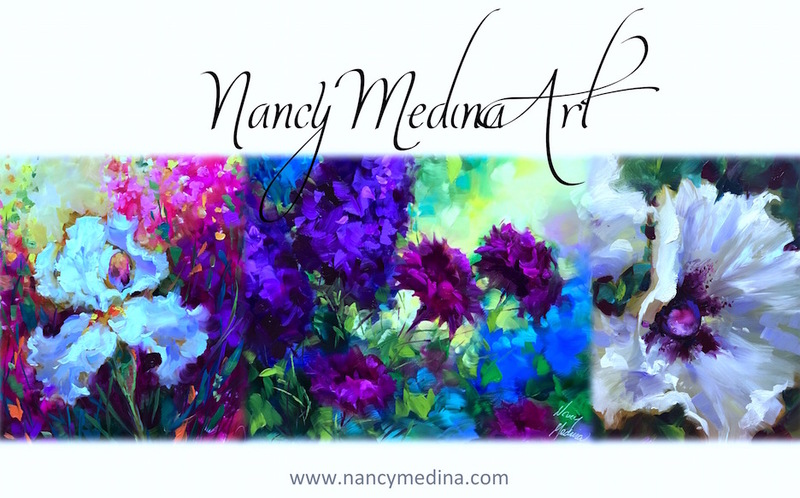 Click here to email me and I promise to get back to you pronto! J'Lynn and her new blossoms! Un merveilleux bouquet. Un magnifique contraste avec le bleu du vase... et nul doute d'excellents moments de partage. i love that you are expanding your workshops in qty & locations. you are so generous and inspiring! 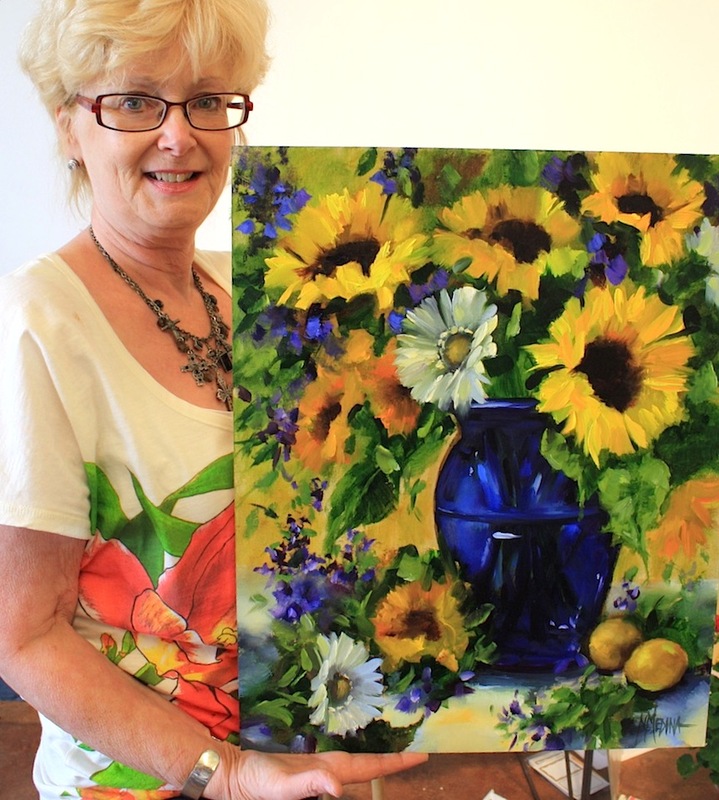 You make sunflowers even prettier than they already are, Nancy. Lucky JLynn.